If there is one food I would recommend getting into your body on a regular basis it would have to be raw fermented sauerkraut (naturally fermented cabbage). This stuff is loaded with probiotics to help line the gut (digestive tract) with beneficial bacteria while also providing important vitamins, minerals and enzymes to help with digestion and gut health. Sauerkraut also helps to get rid of toxins in our body as well as reducing and eliminating fungal and yeast issues like candida. Eating as little as one heaping tablespoon per day can help to reduce sugar and carbohydrate cravings while also supporting a healthy immune system. Store-bought raw sauerkraut is well out of our budget, and we also eat a ton of it in our household (my two children honestly can’t get enough of the stuff). It is also one of the easiest fermented foods to make and great for those who are wanting to start getting into the probiotic-rich fermented foods. For these three reasons I make it myself on a regular basis. I have to admit that my kids and I were not very keen on sauerkraut when we first started eating it, but shortly after eating it on a daily basis we grew very fond of it and now happily eat about a 1/2 cup worth every day. If you are wondering how to get this great, but strong-tasting, food into your kids, I started with just giving a tsp of the liquid in a smoothie or in a savoury meal that was not too hot (otherwise the heat will kill the good bacteria). And then I started strongly encouraging my older child to have a tsp of the actual sauerkraut (bribery was worth it in this instance!). My younger child has been eating sauerkraut since she began eating solid foods at 6 months and she adores the stuff. I have never had to encourage her to have it. She asks for it regularly. I’m hoping child number three will be as keen! A huge thank you to my good friend Hannah Schickedanz for illustrating this gorgeous image and allowing me to use it. Hannah is a very talented illustrator from New Zealand and is currently travelling around NZ on a house bus with her hubby and their two adorable kids. You can keep up with her blog and see her illustrations here. *Cabbage quality is key! A dry cabbage will produce a dry kraut. The best cabbages are dense, juicy cabbages. Also, if wanting to use red cabbage, it is best to do a 50/50 mix of green and red cabbage as the red cabbage tends to produce a soft kraut, while the green stays nice and crunchy. **The ratio of salt is actually quite important and the general rule of thumb is to use approximately 15gm salt per kg of cabbage. This keeps the kraut crispy while not being overly salty. Marlborough sea salt or pink himalayan sea salt work really well. ***Make sure your jar is made from a thick, sturdy glass as a surprising amount of pressure will build up inside of the jar during fermentation and we want to avoid an exploding jar! I have also used old jam and peanut butter jars when I have run out of bigger jars. Peel off the darker outer leaves of the cabbage and set them aside for later. Using a sharp knife, core the cabbage and shred it into very thin slices (about as thin as you can cut it easily). You can also use a food processor with a shredding attachment if you have one. Place shredded cabbage into a large clean bowl or very clean bucket (I use a flexi-tub). Sprinkle amount of salt needed to get the 15gms salt/kg of cabbage. Add caraway seed if using. Toss the salt through the cabbage for a minute or so and then leave it to sit for 30 minutes. Allowing the salt to draw the liquid out of the cabbage means less work in pounding the cabbage. Begin pounding the shredded cabbage with a blunt (French-style) rolling-pin or knead/massage it vigorously with your hands. It will take about 10 minutes to get the cabbage to release the juices. Taste the cabbage and add more sea salt if you think it needs more, depending on the size of the cabbage used. If there isn’t much juice from the cabbage, continue to pound for a few more minutes. The juice should come to the top of the cabbage when pressed down. Place cabbage and juices into cool, clean jars leaving at least 5cm (2 inches) from the top of the jars. This will allow the cabbage to expand during fermentation without the juice escaping. Over filling will cause the juice to escape and you will be left with dry sauerkraut that is not very pleasant to eat. It is worth the effort of cleaning and using more jars if necessary, trust me! Rinse the outer reserved cabbage leaves and curl them up and place on top of the cabbage and juice and press down gently. Use as many leaves as you need to keep shredded cabbage below the juice once the lid is on. Screw lid on loosely or cover with a muslin and elastic and leave at room temperature out of direct sunlight for 3-14 days, depending on the temperature in your house. I start opening one jar of my sauerkraut on day 3 to check the flavour and continue to check daily until I like the flavour. It should taste sour and a bit salty and sometimes fizzy. Once it tastes ready store it in the fridge. It will keep for at least 6 months in the fridge, but we usually only get one or two weeks before ours is all gone! If you see white mould growing, this is generally harmless and can be scraped off. But if you see blue, black or red mould you will need to discard the batch and start again. 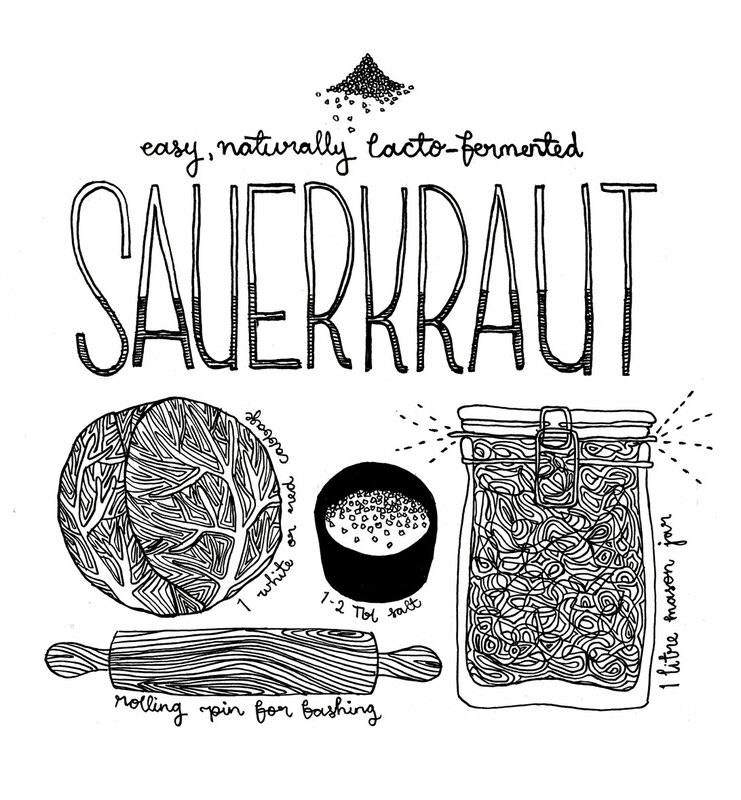 I drew this after my friend Bonnie taught me to make Sauerkraut. We ate the stuff heaps while living in Germany, and I’m loving how cheap it is to DIY. Consider this day 76.